What Are Pustules and Why Do I Have Them? 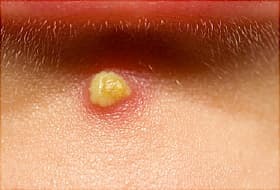 A pustule is a bulging patch of skin that's full of a yellowish fluid called pus. It's basically a big pimple. Several conditions, ranging from something as common as acne to the once-deadly disease smallpox, can cause pustules. They show up when you have some sort of infection your body is trying to fight it off with white blood cells. That can result in a mixture of infected fluid and dead white blood cells (pus). When pus builds up under your skin or in a pore, it can cause a pustule. Acne: This very common skin condition causes pustules that are bigger than typical pimples. They happen when one of the pores in your skin gets so irritated that its walls break. Psoriasis: This is a skin condition that causes red, itchy, scaly patches on your skin. An infection, stress, certain chemicals, and some medications can all trigger an attack of pustular psoriasis. Rosacea: This skin condition normally makes the skin on your face red and causes pimples. But a form of the disease known as inflammatory rosacea can create pustules. Chickenpox: This childhood disease and other illnesses caused by a related virus cause skin lesions that become pustules as the disease progresses. IgA pemphigus: Pustules are also a symptom of this rare disease that makes your immune system turn on itself. Smallpox: Pustules were one of the most obvious signs of this deadly disease that killed millions of people in past centuries. Thanks to a vaccine, it isn't a danger anymore, but samples of the virus are locked up in laboratories in the United States and Russia. Your doctor will treat the condition that's causing the pustules, but a topical medication you put directly on your skin or an over-the-counter treatment like calamine lotion or benzoyl peroxide gel might help with them in the meantime. University of California San Francisco Medical School. American Academy of Dermatology: "Different Kinds of Pimples." National Psoriasis Foundation: "Pustular Psoriasis." American Family Physician: "Evaluating the Febrile Patient with a Rash." Archives of Dermatology: "Subcorneal pustular dermatosis-type IgA pemphigus with autoantibodies to desmocollins 1, 2, and 3."